With Auckland sitting on the twin harbours of Waitemata and Manakau which feed into the Hauraki Gulf, there are a huge amount of beaches to explore. Often you'll have the beach to yourself. On the North Shore region there are plenty of golden sandy beaches, often in the setting of a regional park. 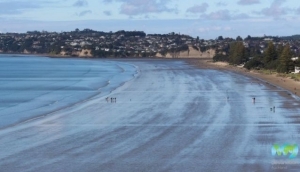 Some of our favourites include the beach at Long bay Regional Park (near Torbay), the 3km long beach at Orewa and the beach in Wenderholm Regional Park. Further north, check out the stunning Anchor Bay in Tawharanui Regional Park. Over on the west coast, surfers will enjoy the surf at the iconic black volcanic sandy beach of Piha Beach. Closer to the city, head out along East Tamaki Drive to the popular beach suburbs of Mission Bay and St Heliers Bay. Our Auckland Beaches guide includes videos and 360 Virtual Tours to give you an even better insight into the beauty that awaits.